Everyone has a vision during pregnancy of what is supposed to happen, and that vision never includes the NICU or having a premature baby. The feeling of loss of a term baby and ability to immediately bond and care for that baby is often coupled with feelings of sadness and guilt. Babies in need of immediate neonatal care are often quickly taken away and the parents may feel disconnected from their new baby. With this separation comes uncertainty regarding the infant’s future health and developmental potential, and the immediate and long-term effects this separation from bonding with the family can have. Kangaroo Care was originally developed in the early 1980’s by two neonatologists in Bogota, Colombia South America. Because the hospital could not afford high-tech equipment such as incubators to keep these small premature babies warm, they used what they had to keep these infants body temperatures stable, their mother. The concept of Kangaroo Care was born. Mothers would hold their babies skin-to-skin on their chest for 24 hours a day, sleep with them, and let them suckle at the breast. Dramatic improvements were seen in these infants. Not only did they survive, but they thrived- gained weight faster, kept their temperatures stable, their heart rate and breathing were regulated, and they were discharged home from the hospital sooner. The concept of Kangaroo Care has since been proven to be safe and very beneficial to even the smallest of preterm babies. Holding your baby skin-to-skin is one of the best ways for you to get involved in the care and bonding of your preemie and help your baby thrive. Babies are calmed by the presence of their mother, and maternal-infant bonding is improved. With breast milk easily accessible, kangaroo care can often help facilitate breastfeeding in babies who are old enough to begin to suckle. Kangaroo care can even improve a mother’s milk production. Both mothers and fathers can benefit from improved bonding with their baby. Often parents will become more in tune with their infant's needs and begin to feel more comfortable and confident in their ability to care for their premature baby. 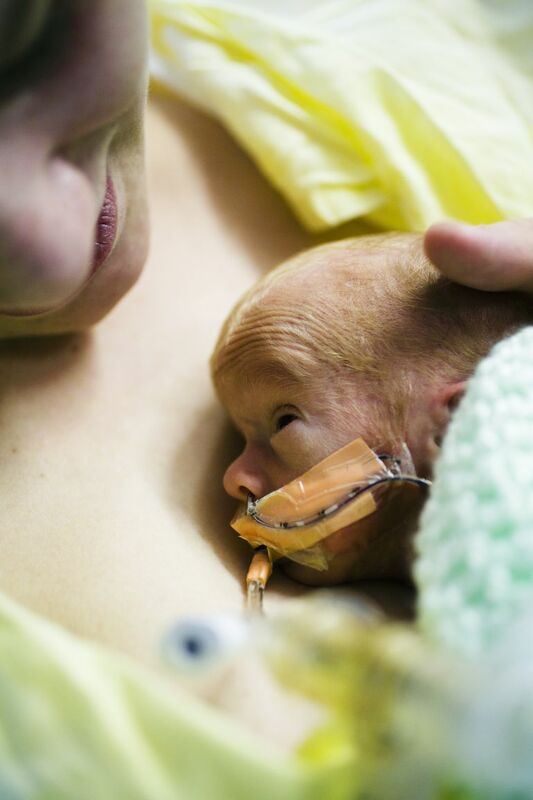 Kangaroo Care also helps to reduce the stress of the NICU for both parents and babies. Science has proven that kangarooed babies thrive better. Preterm infants that have this skin-to-skin connection with their parents gain weight faster, cry less, have a more stabilized body temperature, sleep better, breathe better, are often more alert, and have more stable heart rates. Kangaroo Care should be performed at an optimal time for your baby and is often best coupled with caregiving times. It’s best to select a time when your baby will be getting fed or hands on care by the NICU team. If you are planning on breastfeeding, this timing will help the baby learn to suckle at your breast and help with your milk supply. An optimal time for pumping is right after a Kangaroo Care session. Keep in mind the importance of sleep cycling in premature babies. It is best if you can commit to at least an hour of time to your kangaroo sessions as to not interrupt these important developmental and neurological growing cycles. It is important to know that each individual NICU has their own protocol on Kangaroo Care and when it is an appropriate time to begin skin-to-skin care with your baby. Ask your nurse when you can start this very important and exciting process, and empower yourself and your baby with the healing power of touch.